Cambridgeshire has been subject to widespread gravel (aggregates) extraction throughout the 20th century and, like much of the rest of the country, intensively since World War 2. The county is crossed by three great river valleys - the Cam, the Great Ouse and the Nene - that produced large swathes of river gravels thus creating the local resource for extraction. A considerable amount of archaeological records have been generated by this extraction activity and collectively these records provide details of human habitation and impact on the Cambridgeshire landscape from the Palaeolithic through, unbroken and often in great detail, to the modern day. An investigation of this material affords an opportunity to chronicle the landscape history of great swathes of Cambridgeshire and to contribute to both the archaeological and palaeontological records. 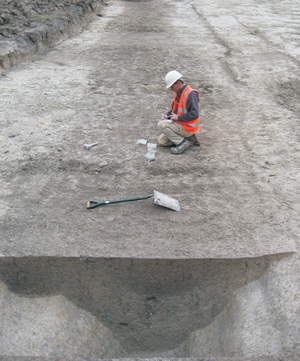 A study by Oxford Archaeology East has been carried out as part of an Aggregates Levy Sustainability Fund (ALSF) commission to identify and assess the full spectrum of archaeological records and interventions on the Cambridgeshire Gravels, and subsequently to identify the degree to which backlogs of analysis and publications exist.